Dark Horse compiles Michael Hague’s mini-series into a hardcover volume. 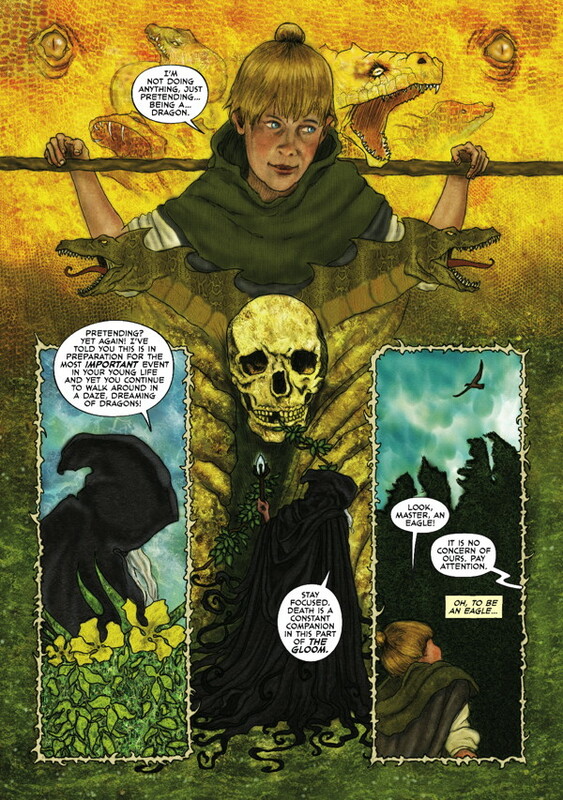 Last year Dark Horse Comics released Eye of Newt as a four part mini-series but Michael Hague’s fantasy tale now finds what I believe is a more appropriate home. 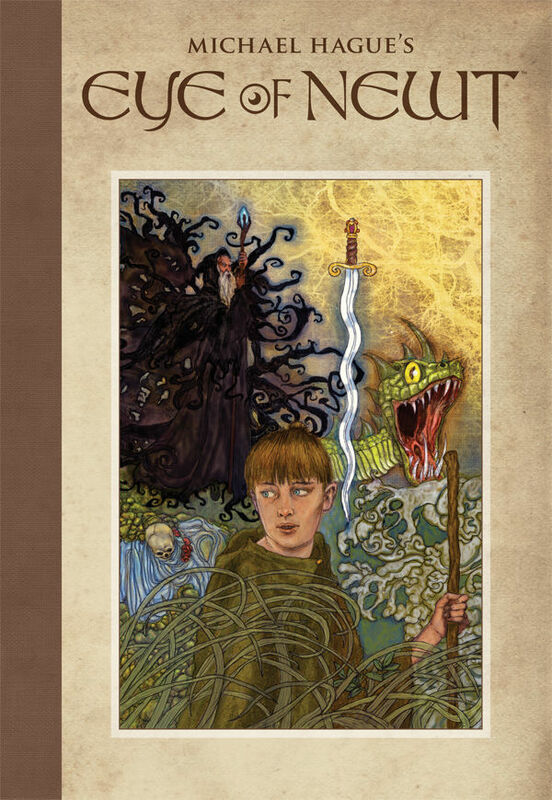 On January 28, 2015 Dark Horse will compile Hague’s unique twist on Arthurian quest legends into a hardcover edition. The book is a dream for fantasy art enthusiasts. It’s filled with wizards, dragons, ogres, mermaids and toadies. All manner of natural and phantasmagorical beasties are depicted, surrounded by equally interesting flora. 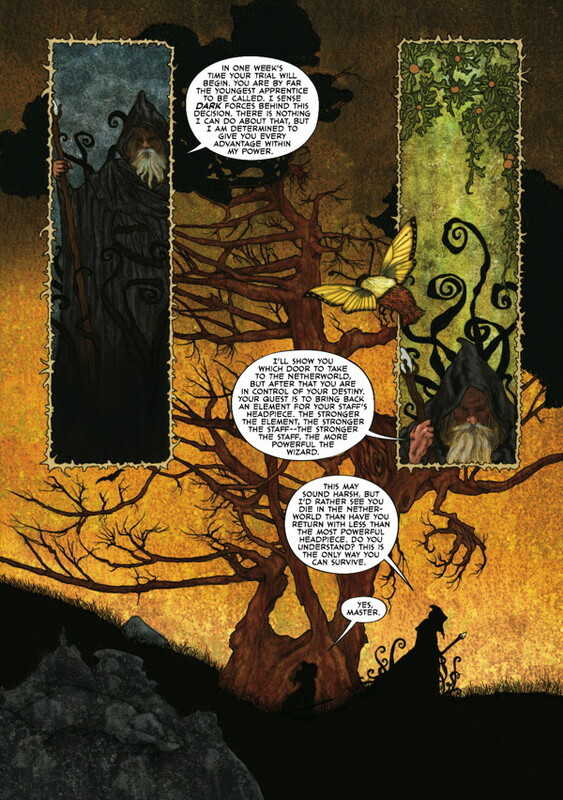 Hague is well known in fantasy circles for his superbly detailed and beautifully colored art, and fans of adventure legends will not be disappointed with Eye of Newt. It is a visually sumptuous feast for the eyes, one that you will peruse over and over again and still catch previously unseen details. Hague’s illustrations will remind some viewers of the work of Arthur Rackham, and his attention to natural details would have made John Ruskin and the Pre-Raphaelites beam. I also see hints of Gustave Klimt in Hague’s dense panels and juxtaposition of natural earth tones and brilliant jewel colors. 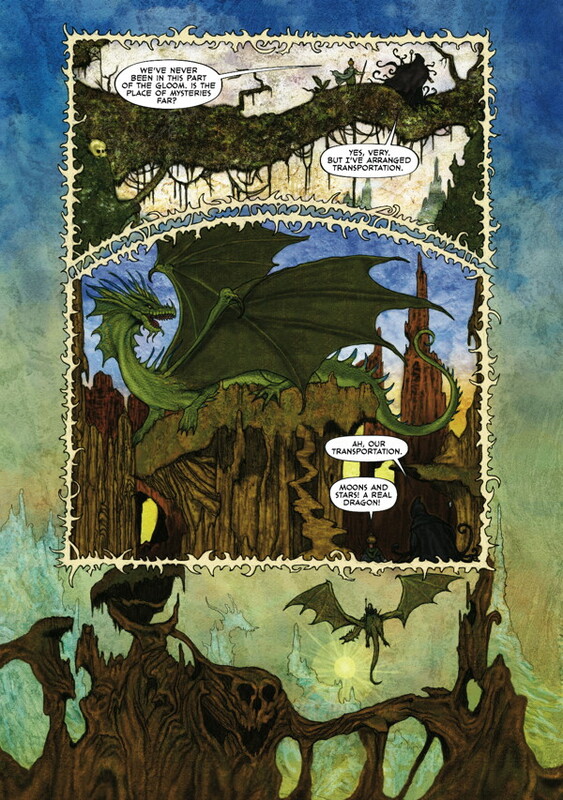 If you are unfamiliar with Michael Hague’s art beyond the pages of Eye of Newt you owe yourself a visit to his personal website. The artist himself points to influences from classic Japanese prints to Howard Pyle and the Brandywine School artists. The site has many beautiful examples including one that reminds me of the riot of pixies painted by Richard Dadd in his epic “The Fairy Feller’s Master Stroke.” Dadd’s painting was frenetically assayed in song by Freddy Mercury on the Queen II album. In addition to compiling the four books under one cover, Dark Horse has added a Sketchbook section with lots of Hague’s pencil work. It’s interesting to see the structure of his pre-embellished art. Readers are treated to several unrealized characters and creatures and the artist’s own commentary on the preliminary pieces and gestation of the project.